Though once opposed to the use of marijuana, Valentia Piccinini, the mother of several former Carmel Unified students, is now fighting to open a medicinal marijuana dispensary in Monterey. For the past 25 years, Piccinini has been suffering from a crippling case of multiple sclerosis. Piccinini’s case manager from Stanford Hospital sent her to a doctor in Santa Cruz who suggested that she use medicinal marijuana, saying that if she could get rid of the stigma that she had been raised with, marijuana could greatly increase her quality of life. Now, Piccinini’s view of the drug has changed—and her desire to open a dispensary goes hand in hand with her desire to help people suffering with illnesses like hers. In addition, she hopes to educate her patients. Piccinini plans to have a doctor, nurses, and a registered pharmacist on site. The products sold from her dispensary will also be tested on site. At the council meeting, Piccinini also acknowledged her initial hesitancies about the drug. “My biggest concern was that I had teenage children at home, and there was no way I was ever going to smoke, and I didn’t want my kids to ever smell it and say, ‘My mom did that,’” recalled Piccinini. In her appearance before the city council, Piccinini emphasized that there are many ways to take the drug and that each product she would sell would have a label marking the dosage (strength and amount of THC). Kogan reminded the city council that they have the power to regulate the drug however they want, be it by only letting people 21 and older purchase the marijuana, by only allowing non-psychoactive forms of the drug to be sold or by regulating the dosage. It is now up to the council to determine whether they wish to vote to revisit their August 2011 ban of dispensaries, and then vote again to approve or deny Piccinini’s request to build a dispensary. 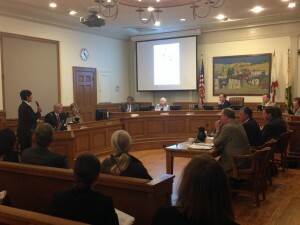 Before making a decision, however, Monterey Mayor Chuck Della Sala wishes to see a report on the number of traffic accidents in Colorado before and after the legalization of marijuana, and a report from a local substance abuse treatment center, Sun Street Centers, detailing their opinion of medical marijuana distribution. As of now Della Sala wants there to be no THC or intoxicants in the marijuana sold at the dispensary. A business plan and input from the city attorney and police chief was requested by Councilwoman Libby Downey. Valentia Piccinini speaking at the Monterey City Council on Oct. 7 in support of a medicinal marijuana dispensary. Many of the community members who came forward in support of the dispensary remarked that medicinal marijuana would most likely not be going towards young users, but that the large older population on the coast would reap the benefits. Local registered nurse Karen Mankins works at a nursing home and feels that a dispensary in the area is necessary. She added that medicinal marijuana can help elderly patients with arthritis, reduce tremors and increase appetite. Cannabis user, Carmel resident and cancer patient Peter Wells noted that the medicine has greatly helped him, but that there is no place he can go with trained staff to receive it. He said that Piccinini’s dispensary would help many people like himself. Piccinini’s own son-in-law, Mike Michalski, was diagnosed with stage four cancer. Although he was morally opposed to the drug, citing that he has never smoked before in his life, he says it has hugely impacted his wellbeing. One dissenter at the city hall meeting, Abra Tockerman, said she has “a problem with someone who tests their own products” and is afraid that if the city allows one dispensary, how many more will follow? As for the future, it remains up to the city. Piccinini cites Proposition 215 of the Compassionate Act of 1996, which allows people with a medical card to buy marijuana, as a key reason to allow a dispensary.